Mezzo-soprano Christine Rice is a relatively rare visitor to London's recital halls so it was a pleasure to be able to hear her in recital with Julius Drake for the first of Temple Music's Temple Song series of 2017, at Middle Temple Hall on Monday 23 January 2107. Abandoned women seemed to be the underlying theme of the programme as we opened with Haydn's Arianna a Naxos and closed with Poulenc's La voix humaine, in between there were Ravel's Chants populaires and Kaddisch. Haydn's cantata Arianna a Naxos was written around 1789/90, with keyboard accompaniment, and swiftly became one of his most popular works. In a sequence of recitatives and two arias, Arianna wakes up, looks for her beloved Teseo, then sees him fleeing on his ship and finishes with a lamenting aria. This was in no sense an historically informed performance, Christine Rice and Julius Drake used the full range of their modern resources. The opening recitative was taken at quite a leisurely tempo, but this gave plenty of space for Rice to show us what a fine singing actress she is, combining a feel for the words with richness of tone and a remarkable amount of character both in the voice and in the dramatic presentation; the result was rather gripping. The first aria,'Dove sei, mio bel tesoro?' was sung with an expressively shapely line, and full, sculpted phrases. Though in no way dramatised, Rice's vivid presentation gave us a strong sense of Arianna's dramatic presence. In the second recitative, when Arianna discovers Teseo has left, the drama became positively operatic. The final aria, 'Ah, che morir vorrei' started off steadily, showing off Rice's shapely way with the phrases, bring out the intensity of the music and with remarkably vivid second half. Ravel's Chants populaires were written for a folk-song competition in 1910, we heard four of them. The Chanson espagnole brought a complete change of mood from the Hadyn, with Ravel's infectiously rhythmic piano part and the way Rice used the dark tints in her middle and lower registers to wonderful effect, capturing the melancholy of the song yet full of character. Rice brought a lovely sense of innocence to the opening verses of Chanson francaise, gradually letting the performance get more suggestive in a most delightful way. The Chanson italienne was short yet very intense, with slow sculpted phrases. The Chanson hebraique (in Yiddish) is a dialogue between an older man and his son, and Rice gave the narrative a real sense of character, yet both she and Drake brought out the haunting melancholy of the piece. The group was completed with another of Ravel's Jewish folk-song settings, Kaddisch setting a prayer in Aramaic. Almost unaccompanied, with just chords in the piano, the piece created a remarkable effect with Rice's richly sculpted phrases growing in intensity to a thrilling climax. For the second half of the programme we heard Francis Poulenc's 1958 opera La voix humaine which sets a play by Jean Cocteau. There is only one character, Elle, and we only hear her side of the conversation as, with plenty of interruptions, she has a last phone call with her lover before he gets married to his fiancée. The piece deals with depression, intensity, anxiety and obsession, all subjects familiar to Poulenc personally and in a sense there is a lot of the composer in Elle. Poulenc made the piano reduction, but evidently preferred the full orchestral version. Whilst the piano version does lack the richness of colour that the orchestra brings, it reinforces the feeling of concentrated intensity and in the hands of a pianist like Julius Drake, the piano is capable of a remarkable range of expressive colour. 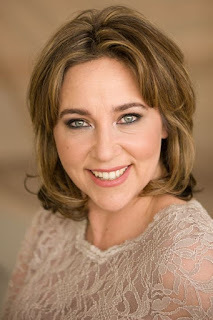 Poulenc intended the work for his muse, soprano Denise Duval, for whom he had written his previous two operas, and though the role is usually sung by sopranos, it sits remarkably well for a mezzo-soprano. Poulenc insisted that the work must be sung by a singing actress, rather than a conventional opera singer. Perhaps Christine Rice brought a richer sense of the voice to the part, giving full rein to her vocal resources, but this was always in character and she caught the character's real feeling of neurotic intensity. The piece was not strictly staged, Rice was using a music stand, though she looked at her music discreetly and throughout the opera her visual characterisation was as vivid as the vocal. At over 40 minutes, the piece represents a remarkable individual tour de force, especially in this version for two performers. Poulenc's music gives full scope for the pianist in the many interludes and piano interjections, so that pianist and singer are co-creators rather than singer and accompanist. And whilst Drake matched Rice's neurotic sense of detail in the performance, both also ensured that drama grew in intensity, giving the piece an emotional structure which led inevitably to the remarkably powerful ending. I understand that this was the first time that Christine Rice had performed La voix humaine (and similarly it was Julius Drake's first encounter with the piece as well), and I certainly look forward to future performances.